SRINAGAR, Sept 17: In light of the order by the High Court seeking strict implementation of the ban on cow slaughter and sale and consumption of beef in the State, National Conference has moved a bill in the Legislative Assembly for the forthcoming session seeking omission of Sections 298-A, 298-B, 298-C and 298-D of the Ranbir Penal Code (RPC). Senior party leaders and Legislators including NC General Secretary Ali Mohammad Sagar, Mohammad Akbar Lone and Mian Altaf Ahmed submitted the bill in the Assembly Secretariat. 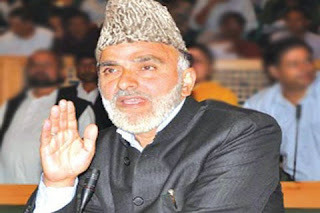 NC General Secretary Ali Mohammad Sagar said the existing law banning sale of beef was in complete violation of the fundamental rights guaranteed to the citizens under the Constitution. “The State can neither force any person to follow a particular line nor can Government interfere in anybody’s religion. We have sought amendment in the law for revoking the ban,” Sagar said. “We have already asked the PDP-BJP Government to bring in an ordinance ahead of Eid-ul-Azha to amend the relevant sections of the RPC so that people are not arrested and harassed while performing the ritual Eid sacrifices in the State. But it has become very evident that PDP has surrendered its voice for the lure of remaining in power. National Conference is very serious about this issue and this is very important to the people of this State. We will bring in the bill in the Legislative Assembly”, the NC General Secretary added. Srinagar, Sept 16: Jammu and Kashmir High Court today issued notice to Government in response to a petition seeking repeal of Sections of Ranbir Penal Code (RPC) on beef ban. The Division Bench of Justice Mohammad Yaqoob Mir and Justice B L Bhat after hearing counsel Faisal Qadri who approached the court through a petition seeking repealing of Sections 298-A , 298-B,298-C and 298-D from the statute of Ranbir Penal Code (RPC), issued notice to Commissioner Secretary Law, Home Secretary and Commissioner Secretary Animal Husbandry Department and sought response from the within one week. “Admit issue notice to the State returnable within one week list after one week”, court said and further added that Government is at liberty to repeal and amend the said provision of RPC if they wish. “In the meantime, pendency shall not come in the way if the State wishes to repeal or amend the said provisions of RPC”, Division Bench added in the order. Advocate Qadri while explaining the term ‘Secularism’ before the bench submitted that these provisions contained in the RPC are ultra vires to the Constitution of India as well as Constitution of J&K and as such these provisions are required to be struck down from the RPC statue forthwith. “The petitioner is aggrieved of the provisions incorporated in the Ranbir Penal Code and is challenging the same on the grounds that said sections are ultra vires to Articles 14, 21, 25 and 29 of the Constitution of India since these provisions have a direct interference with the personal liberty of the petitioner in as much as it allows an intrusions into their religious as well as private life”, Qadri says in his petition. The petitioner further states that these provisions are excessive in nature and prejudicial to the right guaranteed under Article 14 of country as such these provisions are gross and patent infringement on the Right to Personal Liberty and Privacy as is provided in Article 21 of country to each and every citizen. Amid row over ban on sale of beef in J&K, three senior National Conference legislators Wednesday submitted a bill in the Legislative Assembly seeking abolishment of the constitutional provisions criminalizing bovine slaughter in the State. The autumn session of the State Legislature will start on October 3. Senior National Conference legislator Ali Muhammad Sagar said he along with two party leaders Mian Altaf Ahmad and Muhammad Akbar Lone submitted the bill in the Assembly secretariat today. “…In Ranbir Penal Code, Samvat, 1989 the Sections, 298-A, 298-B, 298-C and 298-D shall be omitted… and in the Code of Criminal Procedures Samvat, 1989, the entries relating to Section-A, B, C and D of the Ranbir Penal Code Samvat 1989 shall be omitted,” reads the bill submitted by the NC legislators. Sagar who is also National Conference General Secretary said the existing law banning sale of beef was in “total violation” of fundamental rights guaranteed under the constitution. “The State can neither force any person to follow a particular line nor can government interfere in anybody’s religion. We have sought amendment in the law for revoking the ban,” he said. Following the High Court order on September 9 that called for strict implementation of the existing ban on sale of beef, Kashmir has been witnessing series of protests with the call for decriminalizing sale of beef getting louder. Cow slaughter was banned during Maharaja’s time in J&K according to a ruling documented under Section 298 of Ranbir Penal Code. Pressure is mounting on the State Government to take a call on the issue that has snowballed into a major controversy. The Government, as per legal experts, can take the legislature route to amend the existing law to revoke ban on cow slaughter and set aside the High Court ruling. National Conference, supported by Congress, has already asked the PDP-led coalition Government to promulgate the ordinance before Eid-ul-Adha to end the ban. However PDP’s ally in the Government, Bharatiya Janata Party Tuesday cautioned against any move to amend the law banning sale of beef. Independent MLA Engineer Rashid has also moved a separate bill seeking lifting of ban on slaughtering bovine animals. An official in the Assembly secretariat confirmed they have received the bill from National Conference. The issue of ban on sale of beef is likely to dominate the proceedings during the upcoming autumn session of the State Legislature. “It is an important issue for us. The entire party (MLAs) will press for revocation of ban on sale of beef in J&K,” said Sagar.